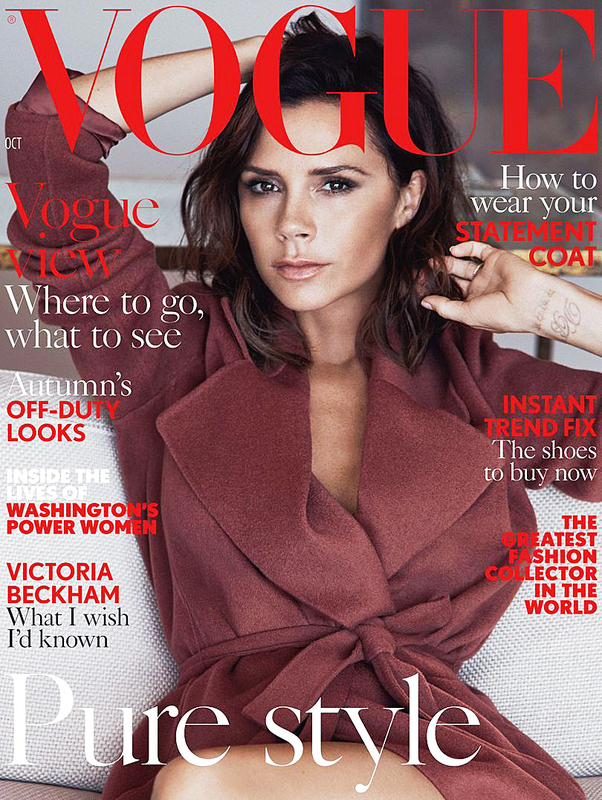 Victoria Beckham on the cover of Vogue UK. Wannabe her lover? Victoria Beckham recalled meeting husband David Beckham for the very first time in the October 2016 issue of British Vogue. The fashion designer, 42, penned a letter to her younger self, titled "What I Wish I&apos;d Known," in the magazine. Victoria opened up about her love life in addition to insecurities and advice she would have given herself about fashion. "Yes, love at first sight does exist. It will happen to you in the Manchester United players’ lounge — although you will get a little drunk, so exact details are hazy," she wrote. "While the other football players stand at the bar drinking with their mates, you will see David standing aside with his family. (He’s not even in the first team at this stage — you are the famous one)," she continued of the former soccer pro. "And he has such a cute smile. You, too, are close to your family, and you will think how similar he feels to you. He’s going to ask for your number. (He still has the London-to-Manchester plane ticket on which you wrote it.)" The couple hit it off at the height of Victoria&apos;s Spice Girls fame in 1997. They later married in Ireland in 1999 and are now parents of sons Brooklyn, 17, Romeo, 14, and Cruz, 11, and 5-year-old daughter Harper. Two months ago, Victoria and David, 41, celebrated their 17th wedding anniversary. "I feel so loved and truly blessed," Victoria captioned a throwback photo from their ceremony via Instagram. "My best friend, my love. The kindest man who inspires me every day. Happy Anniversary to the best husband and daddy in the world!! EVER! #HappilyEverAfter." The dad of four shared a similar picture and message on his account. "Wow 17 years ago to this day this happened… I was lucky to meet someone who has the same drive and wanted the same things in life…" he gushed via Instagram. "We have created 4 beautiful children and I couldn&apos;t wish for a more loving and caring mummy for them… Happy anniversary, I love u."